What Does Code P0458 Mean? OBD II fault code P0458 is defined as “Evaporative Emission System Purge Control Valve Circuit Low Input”, and is set when the PCM (Powertrain Control Module) detects that a part of the evaporative emission control system is not functioning as it should. NOTE: Not all applications have all of the above components, and some applications may contain components that are not included here. Also note that the appearance, location, and functioning of some components will differ between applications. The image below shows a typical evaporative emission control system that is not controlled and monitored by the PCM. In these designs, the fuel vapors are absorbed by activated charcoal in a canister. What are the common causes of code P0458 ? Shorted, burnt, damaged, or corroded wiring/connectors. Vacuum leaks in associated hoses and lines. Failed, or failing PCM. ( Note that PCM failure is exceedingly rare, and the fault must be sought elsewhere before any control module is replaced). NOTE: Where wiring issues are the cause of P0458, other closely related codes may be present as well. What are the symptoms of code P0458 ? In many cases, the only symptom will be a stored trouble code, and perhaps an illuminated CHECK ENGINE light. Apart from code P0458, other evaporative emission control system related codes may be present as well. However, depending on the particular application, especially systems that are not controlled by the PCM, excessive pressure may develop in the fuel tank when the charcoal canister is clogged. In cases where vacuum hoses are dislodged or ruptured, the odor of fuel may be present if the vehicle is parked in direct sunlight for long periods. How do you troubleshoot code P0458 ? NOTE #1: Before starting an electrical diagnosis, be sure to check the condition / fitment of the fuel filler cap, and the condition of the charcoal canister. The most common causes of code P0458 relate to these components, meaning that they should be checked as a first step in the diagnostic/repair process. NOTE #2: Since fuel and vacuum lines used by the evaporative emission control system are often routed together, it is important to have a repair manual for the vehicle being worked on at hand in order to determine the exact location and function of each line or hose. A repair manual will also prove invaluable in locating, and determining the color-coding, location, and function of each wire in the control circuit. NOTE #3: Code P0458 is best diagnosed with the vehicle on a hoist to give easier access to vacuum and fuel lines. The use of a smoke machine will also make the detection of vacuum leaks a whole lot easier. NOTE #4: Operate the vehicle, and rescan for the presence of fault codes after each step in the repair procedure to ensure a reliable repair. Note that some applications may require that several drive cycles be completed in order for the PCM to recognize that the fault had been corrected. Record all fault codes and available freeze frame data for future reference should an intermittent fault be identified later on. Next, inspect the fuel filer cap, and replace it if there is the slightest doubt about its condition and fitment. If the cap is replaced, clear all codes, and operate the vehicle to see if the code returns. If the fuel filler cap is good, but the fault persists, perform a thorough visual inspection of all wiring and connectors in the control circuit. Look for damaged, shorted, or corroded wiring/connectors, and repair or replace as required. If the fault persists, consult the manual to determine the location, color-coding, and function of each wire in the control circuit, and perform continuity, resistance, and reference voltage checks on the control circuit. Be sure however to disconnect all control modules before performing continuity checks to prevent damage to the modules(s). Compare all obtained readings with values stated in the manual. Make repairs as required, and repeat all checks to ensure that all obtained readings fall within the manufacturer’s specifications. NOTE #1: The purge control solenoid and pressure/flow sensors all form part of the control circuit, and these component must be tested for resistance and continuity as well. If possible, use the scanner to test the purge control solenoid repeatedly to check for possible intermittent faults within the solenoid itself. NOTE #2: Be aware that although the purge control solenoid is rated for battery voltage on most applications, the solenoids on some applications may be rated at 9 volts. Be sure to check the required voltage if the solenoid cannot be tested with a scanner, and direct power has to be applied to test the solenoid. 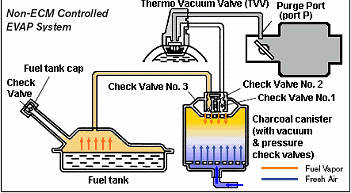 If all wiring, connectors, and the purge valve solenoid check out fine but the fault persists, suspect either a vacuum leak in the system, or a clogged charcoal canister. Both scenarios are equally likely, so if you have not done so at the beginning of the diagnostic procedure, now would be a good time to remove and inspect the charcoal canister for signs of corrosion. Since the canister is located under the car, close to the fuel tank, there is a good chance that corrosion ad taken hold in it, thus preventing its proper operation. If there is any doubt about the condition of the charcoal canister, or if there is evidence of the canister being clogged or damaged in any way, replace it. Clear all codes, and operate the vehicle to see if the code returns. If the canister is good, but the fault persists, place the vehicle on a hoist with the engine running, and allow the system enough time to come into operation. If a suitable scanner is available, monitor the live data stream; the canner will indicate when the PCM commands the purge control solenoid to open. However, confirm the reading by listening for an audible “click” as the solenoid cycles. NOTE: If the purge valve solenoid or pressure flow sensor(s) is defective, a fault code that relates specifically to the evaporative emissions control circuit should be present. Replace the solenoid or sensor(s) as required. If a suitable scanner is not available, check the solenoid’s operation by listening for the “click” as it cycles. If the solenoid is confirmed to be working, thoroughly inspect all vacuum lines and connections for signs of leaks caused by damage, pinching, cracking, or impact by road debris. Note that pinhole leaks may not be visible, so do not assume that leaks are not present merely because you don’t see any. If a visual inspection dos not reveal vacuum leaks, the system must be double-checked with the aid of a smoke machine. Locate the vacuum supply hose in the system, and connect the nozzle of the smoke machine to it. Allow the system to fill with smoke; as the purge solenoid cycles, smoke will be drawn into the system. Keep a sharp lookout for smoke that escapes through small, previously undetected leaks. Smoke cannot escape from a smoke-proof system; where you see smoke, there is a leak, so mark the position of the leak for repair. Repair all leaks found with the smoke machine, but rather replace entire lengths of vacuum line between factory-fitted joints and connections, than attempt to repair leaks. Repairs often start leaking soon due to vibration. Reassemble the system, and operate the vehicle to see if the code returns. NOTE: Charcoal canisters usually have small vents, so some smoke will escape via this route, which is normal, and must be expected. Also, pay close attention to the fuel filler cap; there should not be any smoke escaping past it. If smoke does escape past the cap, it is defective, and it must be replaced. If the code returns despite all repair attempts, it is likely that there is an intermittent fault present. Intermittent faults can sometimes be extremely challenging to find and repair, meaning that the fault may have to be allowed to worsen before an accurate diagnosis, and definitive repair can be made. None found. Ask a question about P0458.